Check out this amazing, underground bike park! Check out this incredible underground bike park! Bike parks are growing in popularity, but what’s a cyclist to do when the rain comes? Move underground! 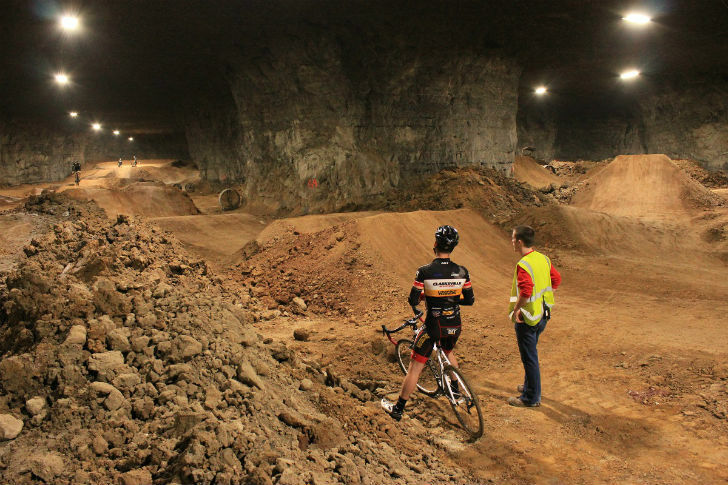 The Louisville Mega Cavern is a 320,000 square foot underground bike park with over 45 different trails, a jump line, pump tracks, dual slalom, BMX, cross country and single track. If you know what all of that means, you will definitely want to check this place out. Built in a limestone cavern 100 feet (10 stories) underground, the caverns are not only a bike-rider’s paradise, but the temperature remains a constant 60 degrees, so even the hottest Kentucky day is a piece of cake for bike riders. This rad bike park is not all the caverns have to offer. If you’re in the neighborhood, you can also check out the Mega Cavern’s zip line, ropes challenge course, tram and other events like their mega Christmas lights display. Kentucky's underground bike park is amazing.